When the United States emerged victorious from World War II, the government had become the owner and operator of the largest fleet of merchant ships in the world, with 4,919 built between 1939 and 1945 under the authority of the U.S. Maritime Commission.1 While some of these ships had fallen victim to enemy action, the vast majority remained in the hands of the government as had happened at the end of the First World War. To dispose of these vessels, Congress passed the Ship Sales Act of 1946. 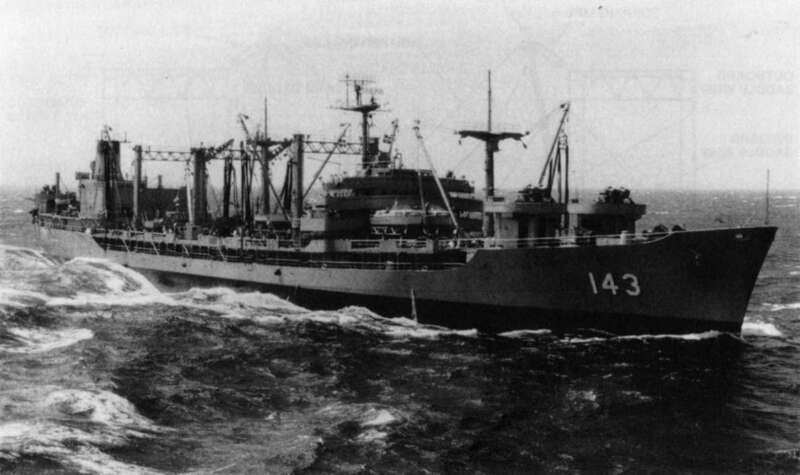 In the following year, the navy received a windfall of thirty T2 tankers when ownership of these vessels was transferred from the maritime commission to the Navy Department. All were commissioned as navy oilers (hull numbers AO-111 to AO-142) and assigned to the Naval Overseas Transportation Service. The ships were soon pressed into service transporting refined petroleum products from refineries in the Persian Gulf. During the war, most of the NSFO (navy special fuel oil), diesel, and avgas consumed by the fleet had originated in refineries located in the Western Hemisphere. The navy turned to the gulf to secure adequate supplies of fuel for the fleet in the oil "pinch" that accompanied the postwar economic boom. The shortage in the continental United States was so severe that when the cities on the East Coast ran low on oil in 1948, the navy was ordered to hand over one million barrels for their use.2 By 1950, 30 to 50 percent of all petroleum products used by the fleet was coming from the Persian Gulf. Each month, navy and chartered tankers moved up to five million barrels of refined petroleum from Saudi Arabia and Bahrain to the Mediterranean and Pacific for use by the Sixth and Seventh Fleets. In the years immediately following World War II, the navy, once again, became the victim of rapid demobilization. While facing the task of supporting the United States on a global basis, it had to contend with the problems of internal reorganization, an uneasy peace, and a nationwide desire to forget the war and any talk of being better prepared for the next. The financial and personnel cutbacks were so severe in the postwar period that the navy found itself temporarily forced to abandon mobile logistic support as a practice. By default, the overseas base once again found itself responsible for providing logistic support to the fleet. The situation was not altered until the outbreak of the Korean War. Once war began, Service Squadron 3 (ServRon 3), established ten days after war hostilities commenced, began to reconstruct a mobile logistic support capability. The same ships that had served so faithfully during the previous war were taken out of the Reserve Fleet and pressed into use. The doctrine of replenishment at sea had to be relearned by the fleet and old skills retaught to new hands. Fortunately the time between the wars was brief, and mobile logistic support was made readily available as soon as the ships of the service force could be reactivated. aircraft sortie rate was higher, combat employment of carriers was on a more continuous basis, and the amount of ordnance expended was greater. From June 1950 until July 1953, naval aviators flew 275,912 sorties to expend 176,929 tons of bombs, 271,890 rockets, and 73,888,000 rounds of ammunition while making over 850,000 runs on targets.6 Although the total number of sorties of naval aircraft were less than the totals in all theaters of World War II, more than 74,000 tons of bombs and 60,000 rockets were dropped on the enemy. The at-sea logistic effort required to support these expenditures was one of the unheralded achievements of the Korean War. Fueling at sea cranes being considered. SOURCE: "Report of Committee No. 2," Conference on Mobile Logistic Support, 19 May 1952, CNO-1952 File, Command Files Post 1 January 1946, Operational Archives Branch, Naval Historical Center, Washington, D.C. The issue of carrier replenishment was taken up by Committee No. 2, which was charged with evaluating matters pertaining to AOs, AORs, AEs, and CVs. Although the navy had more than enough T3-type tankers to meet its needs for the foreseeable future, it was clear that these ships lacked the speed, cargo capacity, and transfer rates needed to satisfy the demanding logistic requirements of modern air warfare as conducted by the Essex-class carriers on Task Force 77 during the conflict in Korea. No longer hampered by a lack of funds, the navy resurrected plans to build a new fleet oiler--the first to be designed from the keel up since the Kanawha was laid down in 1913. Thus, the first item on the committee's agenda concerned the general characteristics proposed for the new ship designated as the AO-143 class. The committee was asked to evaluate its characteristics with particular attention being paid to the proposed refueling data. These are shown in table 22. 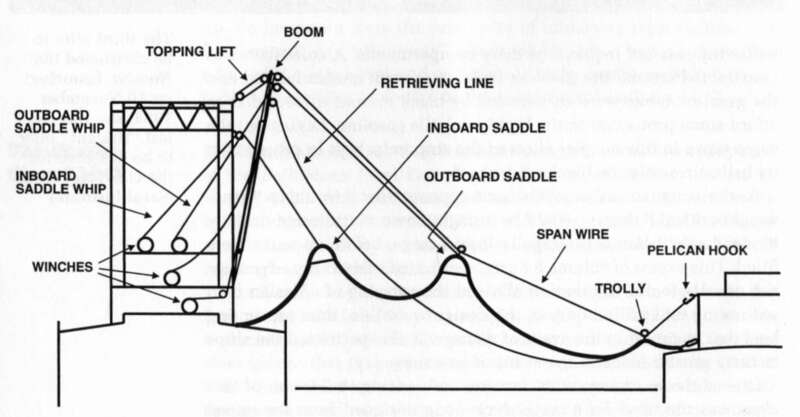 As the design took shape, it became apparent that it would be "deadweight critical," that is, would be brought down to its design draft by its deadweight items, principally liquid cargo, before its tanks were filled. This excess of volume for cargo permitted a flexibility advantage not usually found in oilers. It allowed the carrying of a design load with wing tanks filled only to the design waterline, thus preventing heel due to runoff in the event of damage. It also permitted the ships to carry greater loads in the event of an emergency. The success of the tensioned fuel rig led to its installation in all fleet oilers commencing in 1956.